Its hard to believe that so many classic standards were written for just one musical, but that happened with this enjoyable Rodgers & Hart musical. 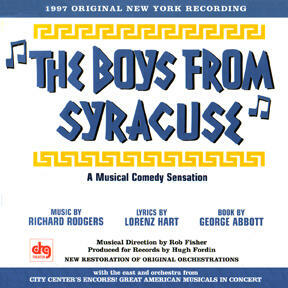 “Falling in Love With Love”, “Sing for Your Supper” (my favorite track sung by the heavenly trio of Rebecca Luker, Sarah Uriarte Berry and Debbie Gravitte), “This Can’t Be Love”, “Come With Me”, “Oh, Diogenes” and others were original written for this show and the result was one of the best scores of the 30s and my favorite by Rodgers & Hart. This City Center’s Encores! cast recording couldn’t be better, with a fantastic cast and terrific orchestrations. Today no one writes scores like this one and I surely miss it.